If you’re attending NAB or BEA, we’d love to see you there! Stop by Booth C859 and Booth B404 and see how FX Design Group is a true leader in the convergence of innovation and technology. KREM, the Tegna owned CBS affiliate in Spokane, Washington, has unveiled a refreshed set with upgraded technology and backlit surfaces along with switching to the group’s new graphics package. WCTV wins set of the year in the NewscastStudio Fan Vote at NAB Show 2018! 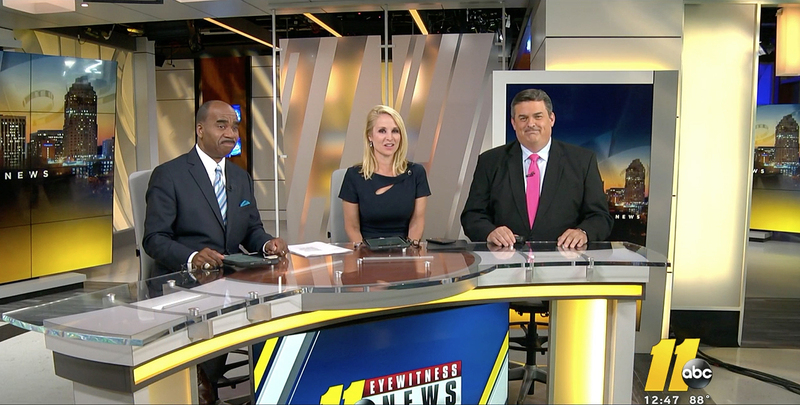 WCTV has received a 2017 NewscastStudio Set of the Year award– our studio won the Fan Vote category! 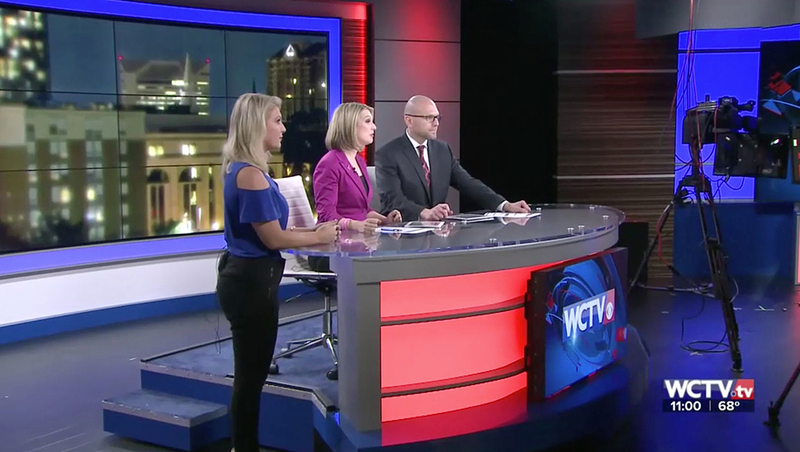 WCTV, the Gray Television CBS affiliate in Tallahassee, Florida, has unveiled a new set, new logo and updated graphics package. Mack McLaughlin discusses the 2017 AutoNation Cure Bowl charity football event with FOX 35 Orlando. 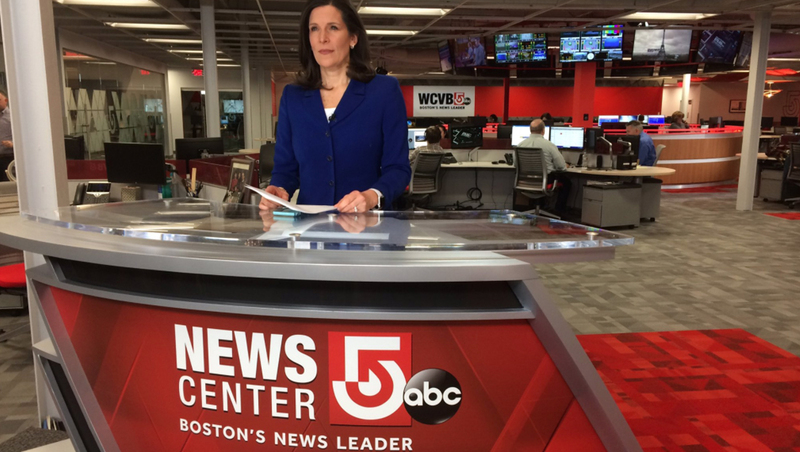 Boston’s WCVB has added a new reporting position from its newly updated newsroom with a custom anchor desk from FX Design Group. Maureen O’Boyle on WBTV’s new set for newscasts. It was unveiled in February 2015 and was cited by a station executive as one of the reasons Channel 3 has gained against rival WSOC. Visit FX Design Group at NAB, April 18-21 at the ChyronHego Booth! FX Design Group is proud to put The REAL in Virtual Reality as we team up with Hybrid and ChyronHego to jointly showcase the best in Virtual and Augmented Reality Design & Development. 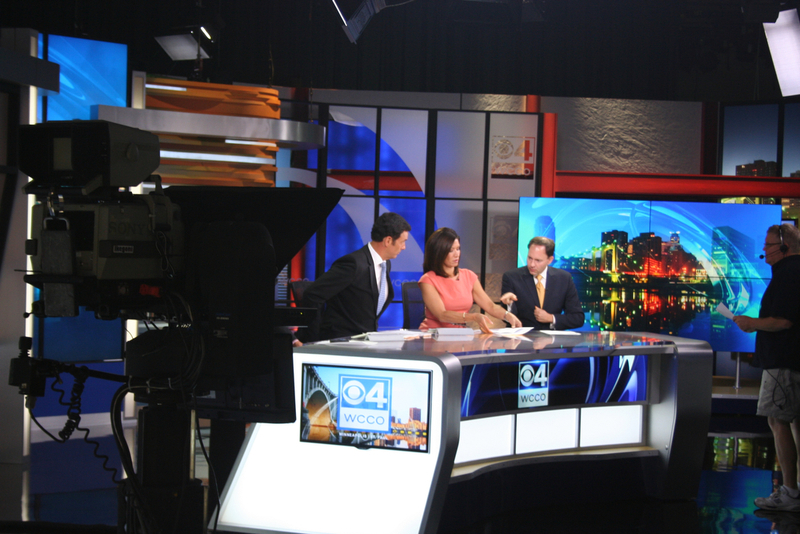 A new set, the first since 2008, brings dramatic changes to the station’s newscast. WBTV Charlotte has added the latest virtual studio technology with Hybrid TV’s Neon system. In a modern, growing city such as Charlotte, the best in technology and design feels right at home. 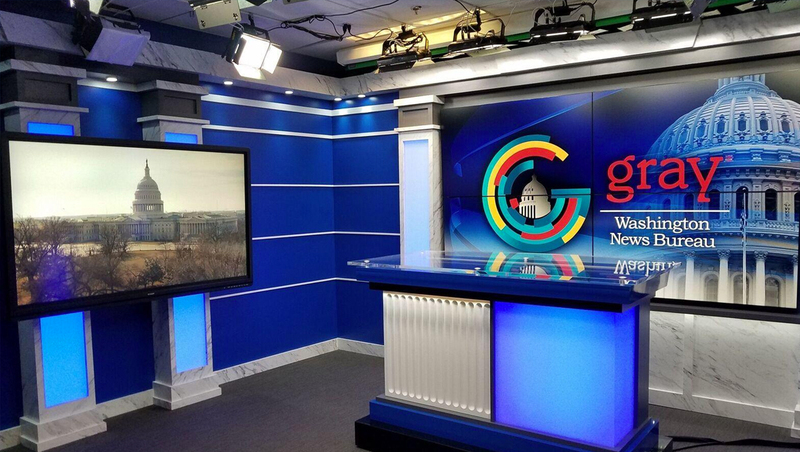 Innovative set designs drive storytelling for new Golf Lifestyle Network. FX Design Group and Giant Octopus design custom look. Growth and innovation serve as catalyst for new hires at FX Design Group. Two new designers join at headquarters in Ocoee, FL to enhance the current design team. WSPA, WCBD and WFLA give audiences in Greenvill/Spartanburg, Charleston and Tampa more reasons to tune-in. FOX19, WXIX Television in Cincinnati debuted a new News Set in today’s morning news. The set, designed by FX Design Group highlights a unique copper color palette offset by color-changing LED display and multiple high-quality monitors. While few U.S. TV stations are opting for full-fledged virtual sets for their news operations, hybrid sets that combine real and virtual elements are rapidly finding adoption due to their versatility and cost-effectiveness. News Cast Studio recently talked with FX Design Group Owner and Creative Director Mack McLaughlin about best practices, trends in the industry, virtual sets and LED lighting. 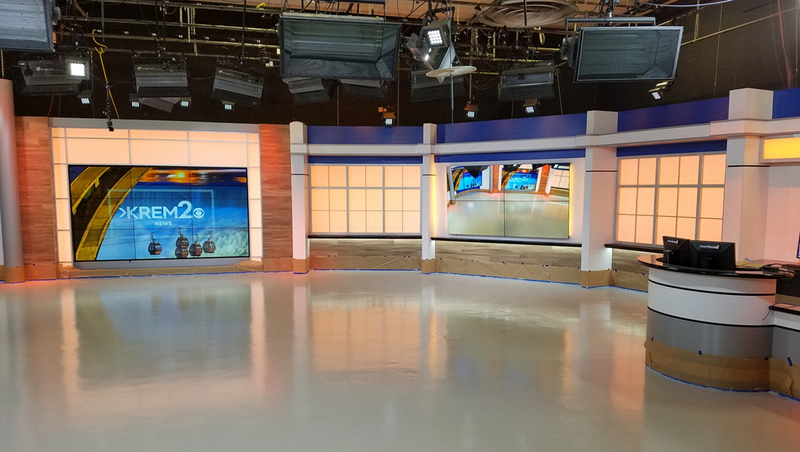 When the WCCO-TV team contacted FX Design Group in early in January 2012 to begin brainstorming ideas for the new studio environments for their Plaza Studio and their Nicollet Studio, the FX design team saw the exciting possibilities. Giant Octopus (GO), the motion design division of FX Design Group (FX), was chosen by Brigham Young University’s (BYU) Sports Division to assist them in their 2012 launch of a newly created comprehensive graphics package. During his days as the GM/VP of the Production Group at Universal Orlando, Paul Meena helped Jeff Scheetz’s dream of starting a Digital Animation and Visual Effects (DAVE) School find a home at Universal Studios. FX Design Group and DeSisti Lighting have partnered together to present an Augmented Reality Set in the DeSisti booth C6037 at the NAB Show 2012. This Augmented Reality Set will feature a high-tech desk backed by a digital (static virtual) background designed by the FX to showcase both FX’s designs and DeSisti’s lighting gear. The rate of change affecting the broadcast industry continues at a torrid pace, so the team at FX Design Group, led by CEO/Creative Director, Mack McLaughlin, constantly asks What’s Next? What’s Essential to the Audience? What does the Future Hold? What began as a new set giveaway contest by FX Design Group over one year ago will appear on air as Western Kentucky University’s NewsChannel12 later this month. Winner of the 2010 Ultimate Newscast Makeover, students at WKU’s School of Journalism and Broadcasting say goodbye to their 20 year-old set and say hello to their brand new, state of the art news set, graphics and music package. Designed for the Schieffer School of Journalism to give TCU News Now a studio lab featuring multifunctional components providing students and faculty alike with a flexible space to both teach and perform. The acquisition by FX Design Group, LLC of Emmy award winning motion graphics designers Giant Octopus originally announced in October 2010 is finalized. FX Design Group, the leader in broadcast news set design and fabrication, purchases Giant Octopus to focus on delivering singular design direction and a seamless interface of motion graphics. Before the vacuum form machine was introduced, scenic elements would be more two dimensional which limited designers. In addition, fabrication required more time and labor in the company’s CNC router department. With the new vacuum form machine FX can create exact uniform copies of each element much more efficiently. The use of vacuum form materials will make a greener choice for FX clients. FX Design Group delivers time and cost efficiencies to Raycom stations with a group-wide set design while retaining color, graphic and material individuality. With FX, Raycom streamlines each station’s involvement in the design and planning process as they move to an HD format, saving time and other costs associated with each new set project.